Oh hey guys... long time no see. Quick update... still on the west coast. Class is currently kicking my rear end. I still don't know where I'm going after here. My F350 is currently racking up a substantial bill at the shop for 6.0L repairs and bulletproofing, which has me evaluating a lot of things. Reality is I'm not in any position to enjoy or support a wheeling habit for awhile, so I think it's time to let go of the Red Rocket and sell the F350 while its still worth something. I'm looking at getting a midsized 4x4 manual truck, for example Tacoma (I would do another MJ if I could find one that meets criteria), to support my outdoor habits and still access streams and crags and campsites, without lugging around 8500lbs of truck with me. Do you know how difficult it is to park a DRW truck in California?!? On the positive side of things, I have been to some amazing places over here. Yosemite/Lake Tahoe/Big Sur/SF are all breathtaking, but Mammoth Lakes is phenomenal, definitely a place I could live permanently. Top quality fly fishing, rock climbing, hiking, etc... all accessed by dirt road. I stay super busy with our outdoor rec. department taking service members out on all sorts of trips like camping, climbing, skiing, etc. Hate to hear that. I'd definitely dump that monster truck. Can you just sell it to get what you need? If you need a place or help getting the red rocket somewhere for storage let me know my friend. Thanks for serving! If you have to get rid of both to get what you want what are you thinking they are worth? He's got the rocket listed in the FS forum as it's currently at Tyler's. $3k for the Jeep. Yeah the XJ is listed for $3k plus incentive to have work done with Tyler. The F350 will be listed around $18k. That would get rid of all my debt and provide enough to buy a cheap project. I wish it could be a XJ/MJ but most likely I will wind up with a Toyota (4x4 manual is a must, and most likely a truck bed). I would much rather get back to having a paid for vehicle that I spend money on than having a monthly payment and being financially restricted on improvements and preventative maintenance. I use the bike to get back and forth to work, right now my only use for the truck are weekends and grocery shopping. Getting ready for a flight. Atta boy Brady!!! Good reppin. Thanks for your service, man. After having my brown dog motor mounts on and what could easily be 5 years and close to 70,000 miles I figured I could shell out the $40.00 for replacement bushings and replace them. Get everything off to pull them out and when I get them off I can’t recognize any harsh wear on them . I think they could have gone another 50,000 before any sort of rubber failure. I’ll get pics up of the wear on them later. Bosch all the way. Direct fit only, no universal. I just pulled a set of brown dogs off mine right before the crawl. They had been on for 5 years and seen a lot of offroad use. 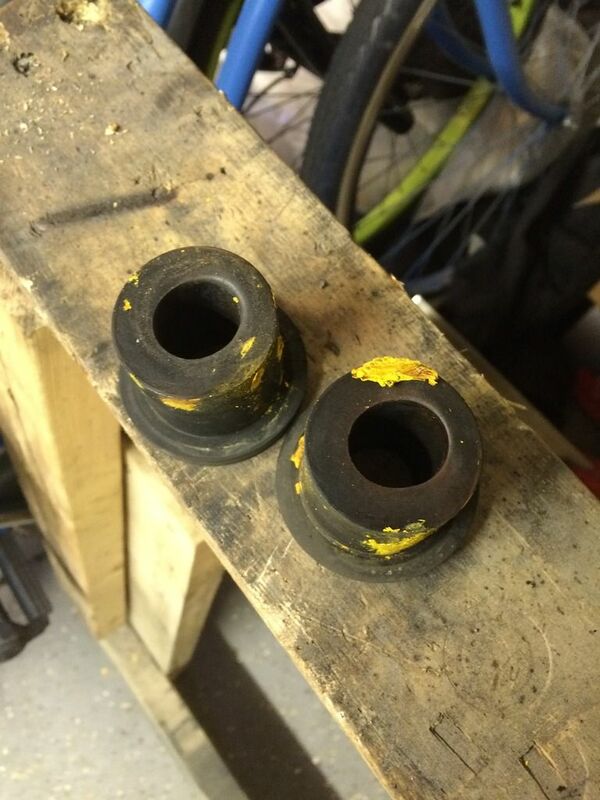 The bushings finally gave up in them, but they were the poly ones. I replaced them with brown dog rubbers, so we'll see how long they last. Stock bushings would probably have only lasted a year or two tops, so I have no complaints. I put brown dogs on right before the crawl. At the same time I did the power steering pump, the transmission mount, and locked the rear. I still have a vibration issues I'm chasing. Not sure where they came from, but brown dog does say that it can transmit vibrations. I believe Denso or NTK would've been the OE supplier for the mopar oxygen sensors depending on time frame. That's what I would stick with. I'm a sales rep for O'Reilly. We carry Bosch, Denso, and ntk sensors. When I still worked in the store we sold more Bosch sensors than either the Denso or NTK, but the failure rate of the Bosch was a lot higher. I remember talking to one of the Bosch reps one year at our manager's conference and he was even saying there are several makes where they recommend going back to the OE sensor instead of theirs. Not that Bosch is a bad sensor, but often times the aftermarket sensor's parameters aren't exactly identical to the OE. Chrysler is especially bad with this. That's why you hear a lot of people recommend going back to the OE for crank sensors and oil pressure senders. The aftermarket just doesn't always jive quite as well as the OE sensor does. If they are all at idle, that's the mounts. I had vibrations after SFR mounts but they are only (mostly) at idle. 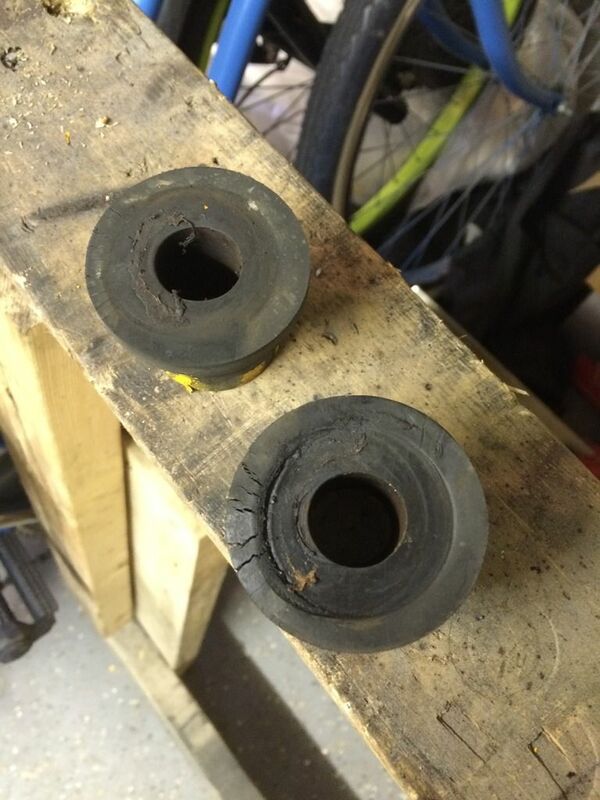 Same thing from a friend who has Brown Dog/ Rubber bushings. I think its just intrinsic to these kinds of mounts. Ok so O2 sensors. What's everyone running? I saw Bosch and NTK on Rock Auto's site. NTK/NGKs only for me. Bosch brand has its place but its not in the O2s - Fuel pump, yea but not O2s. Last edited by Catch22; August 4th, 2016 at 05:23. Interesting. I've run Bosch O2's on everything and never had any trouble. Both foreign and domestic vehicles. It's funny I looked at Rock Auto and their description even says NTK is the largest supplier of OEM sensors. I believe the rubber will be better for you? Mine were all rubber. Here is the passenger side bushing after 5 years and a lot of miles. All rubber. The driver's side looks just as good. Probably won't replace them for a long time now. Normal wear yes, but I wouldn't say that the bushing was going to fail anytime soon.